Our Annual Labor Issue Is Out! Our September/October Annual Labor issue is printing now, and the full-color pdf has been sent to electronic subscribers. (Not a subscriber? Click here to subscribe.) We have posted our lead feature, Class Struggle By Other Means: Tennessee, Volkswagen, and the Future of Labor, by Chris Brooks, and also John Miller’s “Up Against the Wall Street Journal column, “Equal Pay” Is Not So Equal. This issue features a gorgeous cover collage and several interior illustrations by Brian Hubble. The U.S. labor movement has been in a rut for decades. Its problems, to be sure, are not all of its own making; it got into its predicament with no little amount of shoving from employers and the state. But the leadership of the “official” union movement has often been the movement’s own worst enemy. Conservative business unionism, a lack of attention to or enthusiasm for new organizing, and a cozy relationship with employers and the state contributed to a long downward slide from the 1950s on. Over sixty years later, we’re still not out of the rut. The unions’ tactics of “friendly” relations with employers and government officials simply do not cut it—not even in industries that used to be union strongholds. In this issue’s lead feature, Chris Brooks takes us to the auto industry, and the case of Volkswagen in Tennessee, against a backdrop of lavish government giveaways for companies and austerity for the working class. Instead of organizing aggressively around issues like the crushing pace of work, the United Auto Workers (UAW) staked itself on labor-management cooperation, loudly proclaiming its commitment to company “competitiveness.” Brooks calls for a more militant approach, based not only on facing up to conflict with employers and the government, but also on championing a broader agenda for the working class as a whole. There are several other ways, highlighted in this year’s Annual Labor Issue, in which the labor movement’s future depends on its ability to adapt and fight in a changing industrial and political landscape. Labor lawyer Ira Sills puts an encouraging piece of breaking news—the National Labor Relations Board’s recent ruling that graduate teaching assistants at private universities are, indeed, employees entitled to the protections of the National Labor Relations Act—into a broader historical context. As Sills points out, the NLRB became increasingly “politicized” from the 1980s on, especially with the appointment of anti-labor ideologues who were hell-bent on making things as hard on workers and unions as possible. The unions, accustomed to organizing within the NLRB election system, were not successful in finding other ways to organize. But the successes of graduate employee organization and public institutions and the struggles of graduate employees to organize at private institutions certainly provided some of the impetus behind the recent legal change. The question of who is regarded as an “employee” has wider implications in the U.S. economy today, especially in light of the rise of contingent or “gig” employment. Economist Anders Fremstad looks at the reality of work today in one the highest-profile segments of the contingent labor market—“sharing economy” companies like Uber and Lyft. Fremstad argues that the “sharing economy” may work for underused physical assets (that, when lying unused, can be rented out at little cost to the owner), it’s a different story when it comes to labor time. Using even spare time for labor takes something away from the “gig” worker, and the huge slice of revenue that companies like Uber take off the top makes it very hard for sharing-economy workers to scratch out a living. Fremstad argues, instead, for alternative types of “sharing economy” enterprises—such as public enterprises connecting workers with consumers, without the exploitive cut taken by private for-profit companies. Jeremy Brecher tackles the question of labor and the vexing challenge of climate change. He outlines an appealing and feasible program, originated by the Labor Network for Sustainability, that would bring about needed reductions in greenhouse gas emissions while creating more robust job growth than a “business as usual” (fossil-fuel based) scenario. The aim is not just to defuse any possible labor opposition—founded on the canard that environmental regulations are “job killers”—to climate policy. It is also to create the foundation for a new relationship between the labor and environmental movements. New visions for the labor movement like these—visions of broad solidarity rather than narrow interest, of alternative economic institutions, of active struggle for a sustainable future—show how labor can move forward again. 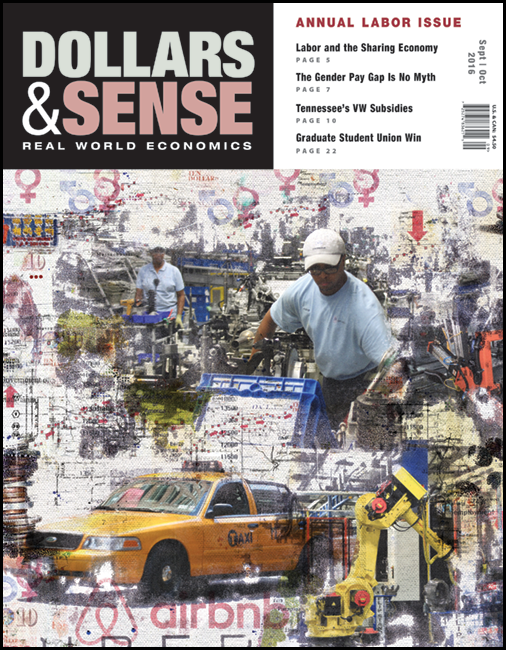 Also in this issue: John Miller on the gender wage gap, Arthur MacEwan on the supposed threat of artificial intelligence, Gerald Friedman on the bleak jobs picture, and more.